With Direct Commander you can quickly correct overlaps and get rid of duplicates among keywords no matter how many there are, even if they are from different campaigns or ad groups. You can only fix overlaps and get rid of duplicates between ads that are shown in the same regions or advertise the same site. Having no overlaps means that any given search query only corresponds to one keyword. This way your statistics will be more accurate. When overlapping keywords are corrected, it means that negative keywords are added so that the keywords become discrete. For example, an ad group contains the keywords fur coat and mink fur coat. Both keywords match the search term mink fur coat, because every word of both keywords is contained in it. A keyword is randomly selected for impression statistics, which makes statistics less accurate. A negative keyword is added to the first keyword in order to fix the overlap, resulting in fur coat -mink. 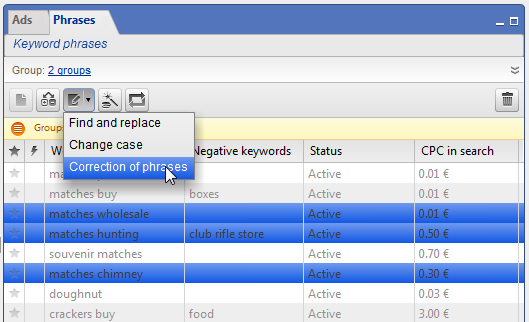 As a result, each search term only corresponds to a single keyword. Keywords that contain identical words, or different forms of the same significant words that constitute the same part of speech are considered duplicates. For example, the keywords elephant food and food for elephants are duplicates. The keyword with the higher CTR remains after duplicates are eliminated. The keywords bike for rent and rental bike are not considered duplicates since rent and rental belong to different parts of speech. When duplicates are deleted, both keywords remain. You can either apply corrections to all groups listed under the Groups tab, or to groups you've selected in advance. In the latter case, select the groups. To simultaneously select several groups, press and hold Ctrl or Shift. You can either apply corrections to all keywords listed under the Phrases tab, or to keywords you've selected in advance. In the latter case, select the necessary keywords. To simultaneously select several campaigns, press and hold Ctrl or Shift. Click and choose Correction of phrases. In the window that opens up, choose the keyword set that you want to correct, select which correction mode you want, and then click ОК. Check the results in the table that appears. If necessary, uncheck the boxes next to the keywords that you don't want to correct or delete. Then click Apply to confirm the changes. Clicking Cancel completely voids the corrections that were made.